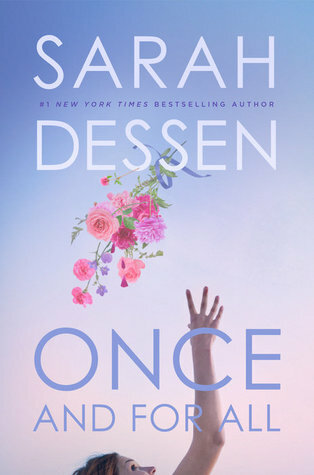 Today I will be reviewing Once and for All by Sarah Dessen! First off, I would like to say how happy I am to finally say that I have read a Sarah Dessen book, and she truly is the Queen of YA Contemporaries. Dessen had a writing style that can only be described as simple but beautiful that only comes with years and many novels of experience. She was able to add just the right amount of humor, sadness, and swooning. Either Josie or William was definitely my favorite characters throughout this book, but I thought that all of the characters were very well-done. I really enjoyed the relationship between Louna and Ambrose in the beginning, I found it funny and real. He definitely deserved it for being a player. Although for a summer read, I definitely would have liked to see a little more romance from the main character early. I did find the dual point in time point of view confusing at first but once I figured everything out, it was easy to follow. Now let's talk instalove. It was annoying to see that after not even 24 hours, two people who were complete strangers were saying "I love you" and calling each other boyfriend and girlfriend. That doesn't really happen in real life. Although there were times in the novel where this was brought up and questioned upon which I appreciated. I wasn't really expecting this story to be what it was. It wasn't completely fluff and when our main character was heartbroken or depressed, I felt for her, which I wasn't expecting either. The best way that I can describe this novel is through early 2000's and late 90's rom-coms. This book was a mixture between 10 Things I Hate About You, The Wedding Planner, and How to Lose a Guy in Ten Days. That How to Lose a Guy in 10 Days aspect was one of the main parts that I wasn't expecting. I did really enjoy this book so I give it a 4 out of 5 yellow roses. Thanks for reading! I hope you enjoyed this review! PS did you catch that all of the gifs that I used were from the movies that I compared the book too? Probably, they were blatantly obvious.